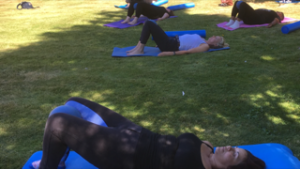 Bronia Hill – For four years I have been attending Equestrian Pilates classes conducted by Nicky Clarke and I am thrilled at the improvement in my overall strength and control whilst becoming more supple. This has greatly enhanced my abilities competing my event horses and maintaining fitness.Highly recommend!! Louise Nice – As a dressage trainer and rider, it is music to my ears if a pupil says they do Pilates when asked. It is the cornerstone to riders being aware of and improving their body posture, strength and control thereby giving the rider stability and effectiveness. I very much enjoy my weekly sessions. Sharon Wayman – Nicky is a fabulous instructor but thoughtful with it. Definitely give it a go! Liz Jenkins – I really enjoy my classes with Nicky Clarke. They have helped me to loosen my tight shoulders and strengthen my core. This is so important for me as I compete at Medium Dressage and my young horse has such a big movement! Ali Phillips – I have been doing Pilates with Nicky for four years. I started doing Pilates because I had a really bad fall from a horse and I needed to get my body back in order. I really enjoy the weekly sessions. I have found that Pilates has helped with body strength, suppleness and through this, my confidence when on my horse has improved. The main benefits I have felt – increased movement in my shoulders, better control of my upper body through the all important core strength, increased flexibility in my hips, better balance overall with an increased awareness of where my limbs are! Nicky is very conscious that each person is an individual and tailors the sessions appropriately. Sometimes we do more relaxation than strength and sometimes vice-versa. I look forward to more sessions but not necessarily more planks! Hilary Coles – Im not a natural class person having failed to sustain in group classes over the years. However neck surgery in 2013 meant I needed to make more effort with my skeleton! 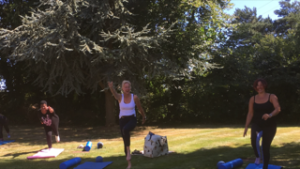 Nicky&#39;s Pilates classes have been brilliant in helping me achieve a full recovery and her greatest strength as a teacher is her ability to adapt the programme to suit individual needs and coming up with constant variety and flexibility. Very insightful. Sue Winder – I’ve been doing Pilates with Nicky Clarke now for years and I’ve definitely got stronger in many ways. I love my classes &amp; Nicky is great at attending to every individual. I highly recommend. The Back-in-Action mobiliser bed is a very useful and popular massage treatment. It is being endorsed by dressage rider Carl Hester, and eventers Harry Meade and Bettina Hoy and many more. It is an extra strong massage bed which aims to promote movement and consequently pain relief in the muscles and joints in your back. At The Balanced Rider we often use it at the end of a physiotherapy treatment to ensure your body is feeling revived and relaxed. We do not sell the Mobiliser beds or have any business associations with Back-In-Action. We find it a very useful piece of equipment which we are happy for people to benefit from if it is appropriate for their condition or symptoms. The Flexchair is a fantastic piece of rider relevant assessment and rehab kit from The Balanced Rider. The Flexchair system is used to assess and treat a horse rider’s seat balance and asymmetry. It is able to help us gauge how much a rider uses their core vs their brute strength, and how symmetrical their movement patterns are in their seat relevant for horse riding. It is easy to use, the rider only has to sit on the comfy saddle seat and follow patterns on the computer screen. It is a simple but clever piece of engineering comprising a saddle seat connected to a real time computer programme. This can be used on it’s own to demonstrate to a rider where their functional movement is causing them problems or can be used as a ‘test’ to obtain a score which can be remeasured as treatment progresses. It is highly portable and can be used in the clinic, home or yard. Cupping is originally part of Traditional Chinese Medicine but has seen a resurgence in Western medicine over the past few decades. Most notably it was seen on many of the swimmers and gymnasts in the Rio Olympics. At The Balanced Rider we have been using cupping for over ten years. It is a very biomechanical treatment which aims to stretch and lengthen tight muscle tissue. In this way it promotes pain relief, increases movement and helps reduce muscle tension. It is particularly useful around the neck, shoulders and upper back. Not long now …… this website is currently under construction. Sign up to receive details of the latest events & treatment offers!